Forest, wild and precipitous, and intersected with deep ravines. The slope of these mountains is abrupt toward Bohemia; they are covered with forests and swamps, infested with bears and wolves, and are a part of what was known to ancient geographers as the Hercy-nian forest. Their geological formation is the primitive granite and gneiss, and they furnish gold, silver, lead, iron, coal, zinc, black lead, cobalt, and antimony. The Moravian mountains run N. E. from the southern to the eastern portions of Bohemia, and form the watershed between the Elbe and Moldau flowing X., and the Danube and March flowing E. and S. The Riesengebirge, running from the E. extremity of Bohemia toward the Erzgebirge in the north, present their broken and abrupt descent toward Bohemia, and their higher summits axje bleak and naked. The interior is undulating with hills, sometimes steep, but rising gradually to no greater height than 600 ft. - The river system comprises only the Elbe and its tributaries. The Elbe from the mountains in the northeast, the Sazawa from the southeast, the Moldau from the southern extremity of the Bohemian Forest and the pond and marsh district around Budweisin the south, and theBe-raun and Eger from the western mountains, oonverje toward the centre of Bohemia, and joining at no great distance from Prague flow north in one stream, the Elbe, which passes into Saxony through a channel which it has cut in the sandstone formation of the eastern Erzgebir-e. The Elbe and the Moldau are to a great extent navigable. Bohemia has no large lakes, but has numerous ponds, according to some statements as many as 20,000, and as many as 160 mineral springs which are visited. Of these the saline chalybeate at Franzensbad and Marienbad, the warm alkaline at Carlsbad and at Teplitz, and the bitter and cathartic waters at Seidlitz, Saidschitz, and Piillna, are the most celebrated. - The whole mountain system which encircles Bohemia is of primitive formation, characterized by granite and gneiss, with the exception of a small section where the Elbe cuts through the Erzgebirge and a point on the northwest near Braunau. There are several sandstone masses in the centre of the country, and in many parts hills of basalt. The mineral products are more varied than in any other country of the same size. The lead mines in 1870 produced 22,125 cwt. of lead and 30,780 lbs. (Munzpfunde) of silver. The product of iron in 1870 was 1,277,943 cwt., and of coal 88,281,013 cwt. There are also mines of tin, copper, zinc, cinnabar, arsenic, and cobalt, and quarries of marble, alabaster, quartz, granite, freestone, and sandstone. A large variety of precious stones are found, of which the finest are the Bohemian garnets. - The climate is healthy; the atmosphere clear and salubrious, with a mean temperature of 48° F. at Prague, but much lower in the mountain districts, where the snow frequently lies 12 ft. deep, and often does not disappear until the middle of April, and in some localities stays through the year. - The soil is mostly a clayey loam, and except on the high parts of the mountains, and in some sandy-tracts of the Elbe valley, is generally very fertile. The productive land is estimated at 12,-259,362 acres, of which nearly one half is under the plough, the remainder being vineyards, orchards, meadows, pastures, and forests. Rye, oats, wheat, and barley are raised in large crops. Flax is extensively cultivated, and hemp, tobacco, and hops are also staple products. There is an annual manufacture of about 250,000 gallons of inferior wine, and an annual yield from the forests, which cover one fourth of the surface of the country, of 3,000,000 cords of wood, besides timber. The horses of Bohemia are of a superior breed, but the horned cattle are small. According to the census of 1869, there were 189,327 horses, 1,002,015 cattle, 1,106,290 sheep, 194,273 goats, and 228,180 hogs. - In manufactures Bohemia is by far the most important of the provinces of Austria. 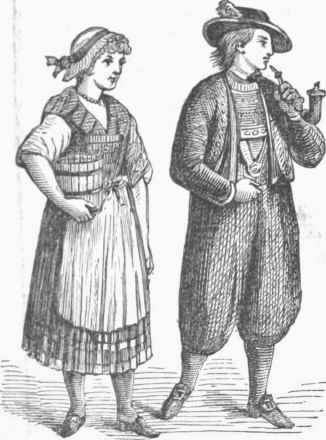 The production of linen goods, partly of the finest description, employed in 1871 about 50,-000 persons, and the aggregate value of the linen goods was 30,000,000 florins. Lace making by hand formerly supported over 40,000 persons at the north, but has greatly decreased since the invention of machine lace, and is now limited to the region between Waldstein and Catharinaberg in the Erzgebirge. Cotton manufactories are increasing; in 1871 there were over 540,000 spindles, producing about 112,000 cwt. of yarn; nearly 60,000 looms were employed on calicoes. These manufactories are in the northern region, next the Erzgebirge, but the woollen factories, of which in 1871 there were 350, are more numerous in the northeast, near Reichenberg. There are over 50 leather factories, and the gloves of Prague are much in demand. The paper mills, of which there were in 1871 more than 70, are particularly numerous in the district of the Eger and in the Riesengebirge. The Bohemian glass factories, about 120 in number, producing annually about 6,000,000 florins and employing 24,000 persons, are renowned all over the world, and work mostly for export, particularly to America; the imitation gems, the looking-glass, and fine ornamental glass ware are unsurpassed. The china, earthen, and stone ware produced in 1871 (about one half in the circle of Eger) were valued at 2,500,000 florins. The iron industry has its centre in the region of Pilsen, Pribram, Horzowitz, and Purglitz; the value of the raw and cast iron produced in 1871 was 1,500,000 florins. The machine factories, the most important of which were in and near Prague, produced machines and tools to the value of 4,500,000 fl. The value of the products of the entire metal industry amounted to about 16,000,000 fl. There are also more than 100 factories of chemicals, mostly in the regions of Pilsen, Aussig-Tetschen, and Falkenau. The factories of beet sugar, more than 130 in number, produced in 1871, 3,400,000 cwt. The total industrial products of Bohemia are valued at 218,000,000 florins. Its commerce is also rapidly developing, owing to the favorable situation of the country. The exports in 1871 amounted to 22,000,000 fl., the imports to 20,000,000. The number of breweries in 1868 was 968, of distilleries 324. - Of the population the Germans constitute about 37 per cent., the Czechs 61, and the Jews 2, the latter using generally the German language. The Germans inhabit in compact masses the northernmost quarter of the country, the mountainous districts, and form a great part of every city and town population, being more given to industrial pursuits; while the Czechs, belonging to the same tribe as the Moravians, are the more agricultural portion of the population, and of all Slavic tribes in many respects the most gifted and cultivated. They are preeminently a musical people, and are fond of song and poetry. With the exception of 45,331 Lutherans, 58,720 Reformed, and 89,539 Jews, nearly all are Roman Catholics. There were 4,008 public schools in 1868, of which 1,762 were German, 2,165 Czech, and 81 mixed. There were 46 high schools of different grades, 11 agricultural schools, 2 mining schools, 1 military school, and 4 theological institutions. The capital, Prague, has 2 polytechnic institutions, one for the Germans and one for the Czechs, and a university. The majority of the professors of the university are Germans, but most of the students are Czechs. The conflict between the German and Czech nationalities has become very animated, and is from year to year assuming larger dimensions. The Czechs chiefly act through the secretaries of the district and communal authorities, while the Germans have established throughout the country political associations. The leaders of the German party from 1862 to 1872 were Herbst, Has-ner, Schmeikal, and Pickert. The Czechs, though united in the conflict against the Germans, have in political questions split into the conservative old Czechs, headed by Palacky and Rieger, and the democratic young Czechs, whose foremost leader is Sladkowsky. The diet of Bohemia has 241 members, consisting of the archbishop of Prague, the three bishops of Budweis, Leitmeritz, and Koniggratz, the rector of the university of Prague, 70 delegates of the Grossgrundbesitz (large landed estates), 72 delegates of the towns and industrial places, 15 delegates of the chambers of commerce and industry, and 79 delegates of rural communities. The diet elects 54 delegates to the Reichsrath of Vienna, and also a standing committee, the Landesausschvss, which is presided over by an Olerst-Landmarschall appointed by the emperor. For administrative purposes Bohemia is now (1873) divided into 89 districts and 2 independent communes. - The earliest inhabitants of Bohemia were the Boii, a people supposed to have been of Celtic race, from whom the country received its name. In the 1st century B. C. they were driven out by the Germanic Marcomanni, whose realm flourished for a time under Mar-bod, the rival of Arminius. This people, however, subsequently emigrated or were driven into Bavaria, and Bohemia was occupied in the 6th century by the Slavic Czechs, who also established themselves in Moravia. Portions of the country were about the same time colonized by Germans. The Czechs maintained their independence, under national chiefs, between the Avars and the Frankish empire, though often harassed by invasions. 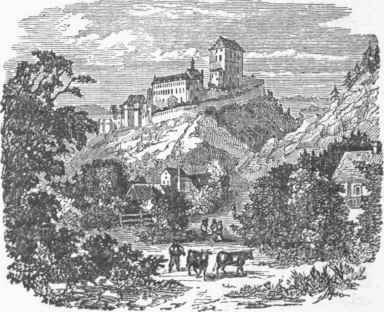 The house of Premysl (Przemysl) became preeminent in the nation. Christianity was introduced from various quarters, but chiefly in its Slavic form by the converts of Methodius about 890, when the king of Moravia, Swatopluk, ruled Bohemia. When the Magyars destroyed his Moravian kingdom, the Bohemians voluntarily sought annexation to the German em-pire, with which they remained connected, in spite of the endeavors for independence of Duke Boleslas I. (936-'67), the murderer of his brother and predecessor St. Wenceslas. Under his successor, Boleslas II., the boundaries of the country were extended to the Vistula, hut subsequently it succumbed for a time to Poland. Wars with this country were often renewed, Silesia being the main object of contention, and ultimately kept by Bohemia. About 1035 Bretislas I. annexed Moravia. The native dukes in 1158 received the kingly dignity from Frederick I. Wars of succession convulsed the country until Ottocar I. (1197-1230), a truly great monarch, made the royalty hereditary. By conquest he and his son Ottocar II. (1253-78) extended their dominion over a part of Poland, Austria, and Prussia, where the latter, on a crusade against the heathen Borussians, founded the city of Konigsberg. After a short struggle against the emperor Rudolph I., in which Ottocar II. perished (see Ottocar), the Bohemian monarchs acquired Poland and Hungary by election; but with .the asaagination of Wenceslas II. (1305) the native ruling house was extinguished, and was succeeded by the house of Luxemburg, until that lino in 152G was superseded by Austrian monarchs. Charles (1346-'78), who as German emperor was insignificant, was a great king for Bohemia, which he augmented by Lusatia and other acquisitions, which were soon lost. Under his reign the country flourished. Prague, then containing the only German university, numbered 30,000 students; science and art were fostered, and manufactures, particularly those of glass and linen, were founded. From the beginning of the 15th century, when Charles's profligate son Wenceslas occupied both the imperial and the royal throne, ideas of reformation began to spread by the teachings of Huss and Jerome of Prague, whose death at Constance in 1415 and 141(5, and the intervention of the emperor Bigigmund, the brother of Wenceslas, caused the outbreak of the Hussite war (see Hussites). Under the sway of the Hussites the throne of Bohemia was filled by election, for a time from the Luxemburg line, once (1458-'71) by a native nobleman, George .Podiebrad (see Podobbbad), and subsequently from the Polish line of the Jagiellos. When the second Bohemian king of this line, Louis, who was also king of Hungary, perished at Mohacs (1526), his brother-in-law Ferdinand of Austria, the brother of Charles V., was crowned king, and in 1547 made the crown hereditary in his house. (See Austria.) In 1618 the Bohemians, under Protestant lead, rose for the restoration of their liberties, and this revolt opened the thirty years' war. In 1619 they chose the elector palatine Frederick V. as their king, but succumbed in the battle at the White mountain, near Prague, in 1620. The most cruel persecution commenced; the Protestants were executed, imprisoned, and banished, and their estates confiscated. The constitution was abolished, the Czech literature, school system, and nationality proscribed, and the native state with its civilization annihilated. No fewer than 36,000 families were forced to seek refuge in Saxony, Sweden, Poland, Holland, Brandenburg, and elsewhere. This, and the sufferings of the thirty years' war, devastated the land. German Catholics were introduced as colonists, and everything German was favored and preferred to such an extent, that the Germans of Bohemia for more than a century furnished more than half of all the officers in the Austrian provinces. The country became intensely Catholic, but the spirit of Czech nationality reawoke after the French wars. The revolution of 1848 inverted the position of the parties toward the Austrian government: the Germans of Bohemia, in common with a majority of the Austrian Germans, opposed their government; the Czechs in Bohemia, together with the other Slavic populations of the empire, looked for a great Slavic empire in Austria, and, in spite of the bombardment of Prague, where a Slavic congress was assembled in June, 1848, supported the imperial authorities. Since that time the political struggles of the Czechs for renewed national autonomy have played a very prominent part in the history of the Austrian empire, while Bohemia itself, which witnessed some of the principal contests in the Hussite, thirty years', and seven years' wars, once more became a great theatre of war in 1866 (battle of Sadowa, July 3).